Howlin' Wolf Records: SIX STRINGS: DJANGO KILL!...IF YOU LIVE, SHOOT! 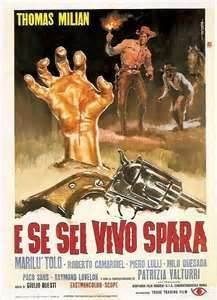 If you are looking for other Italian Westerns that are related to DJANGO UNCHAINED then I recommend DJANGO of course and THE GREAT SILENCE. Both are directed by Sergio Corbucci and both are in my top ten favorite films of all time. Here are links to my older reviews.